If you love swimming and diving, especially in the ocean, this is the perfect article for you! I’ll be covering everything you’ll need to know about freediving, including a few reviews on some good freediving fins and a few questions you may want to be answered about your fins. If you’re interested, let’s get started! 2 What Are the Main Features of Freediving Fins? 3 How Many Types of Fins Are Available in the Market? 4 What Are Top 5 Good Freediving Fins? 6 Why Are They So Long? 7 How to Choose the Ultimate Freediving Fins for You? 8 How to Test Fin Blades? 9 How to Take Care Of Your Freediving Fins? Even if you are a fan of swimming and diving, there’s a chance you won’t know what freediving is if you don’t get to do it often. Freediving is a kind of underwater diving that doesn’t need any breathing apparatus – it all depends on your ability to hold your breath until you resurface. This is where the fins become important. Freediving fins are what help divers move more quickly under the water. They help the kicks become more powerful with the increased surface area they provide. This article will help you pick out a good pair of freediving fins so that you enjoy your experience freediving as much as possible without the need to resurface quickly without diving far. What Are the Main Features of Freediving Fins? There are a few key features of freediving fins you should be aware of in order to make sure you are getting the proper gear for you to enjoy and properly experience freediving. These materials are important as they will what keep your fin both flexible enough to move with the water, but strong and sturdy enough to not break when bent and to push down enough water with each kick to give you more power while you swim. Freediving fins also have foot pockets. This, as the name details, is where you have your feet inside of the fin and have them securely attached. There are even some fins that include interchangeable blade. This also means they will have interchangeable foot pockets, in a sense. If a certain type of blade or foot pocket doesn’t work for you on these types of fins, then you can get new ones and change them out with one another – mostly. Things may differ slightly from brand to brand. If you have a big build and strong legs – get hard stiffness. Next up is the blade of the fin. The blade on freediving fins is between 25 and 50 inches in length. This may sound like too large of a fin, but remember how a larger surface area allows you to propel yourself further. I’ll elaborate more on this later. The blade of the fin can also be fixed or interchangeable, as mentioned earlier. This could be good if you needed a different stiffness of the blade or different length. The heel of the fin can be open or closed, depending on the brand you buy. For the most part, however, it may be in your best interest to buy closed heel fins. This provides better insurance that they won’t fall off and go deeper into the water and it prevents any energy from being wasted or lost by having your foot pocket not entirely snug against your foot. Finally, there is the overall design of the fins. They are very long and rectangular swim fins that you wear that look similar to a seal’s back flippers, in a way. Many tend to have a type of ridge or cut in the very end of the fin in order to let the water bend the fin a little more easily. How Many Types of Fins Are Available in the Market? There are two types of freediving fins you could choose from: Bi-fins and a monofin. A bi-fin is the best type of fin for you to use when you are recreationally diving, buddying, and teaching others. They are the most common ones to choose when freediving. These fins are similar to flippers in a way, especially in how they look. However, these are designed especially for a freestyle kick, are easy to use, and provide much more maneuverability. After all, these are all very important when you are planning to dive without the aid of any breathing devices! A monofin, on the other hand, is much less common to use and a bit more difficult at that. With the monofin, both of your feet are in a single foot pocket that looks like a regular fish fin. This type of fin is best used when you are planning to go deep or to go far in the water. It can be difficult to use, as you are essentially swimming with your feet tied together. A good advantage a monofin has over bi-fins is that a monofin has a larger surface area and can provide stronger kicks. What Are Top 5 Good Freediving Fins? If you are new to freediving, then this is definitely the pair to get. They are also incredibly affordable so, if you decide to not free dive again anytime soon, you won’t feel like your money has been completely wasted. With incredibly comfortable foot pockets, you can barely feel the fins when you wear them. 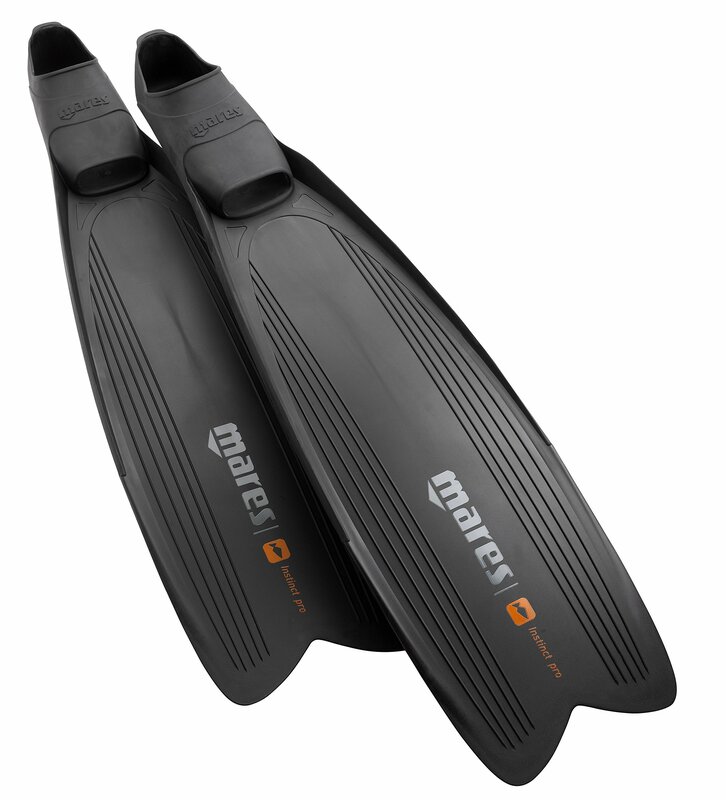 These fins also have a good enough stiffness to them that your legs won’t be tired easily, letting you swim longer. There are even stringers on the sides of these fins that help you go faster, as they increase the water flow. If you’re interested, there are even three colors they come in so you can wear a pair you enjoy more: green, black, and camouflage green. However, keep in mind that there are a few cons. Some have found the fin to be too stiff for them while they are swimming. Also, remember that these fins do require a good amount of leg strength in order for you to use them. So, if you are a beginner with strong leg muscles, these should be the fins you pick. 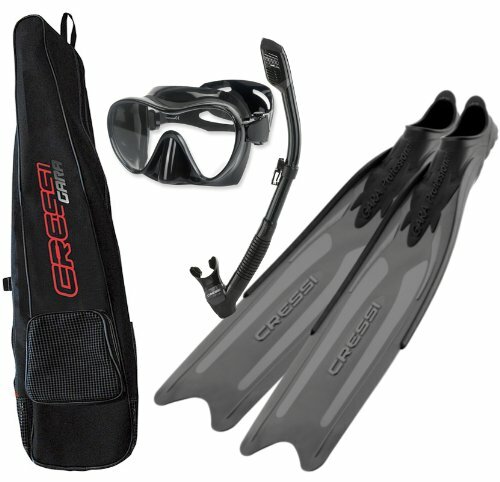 The Cressi Gara Professional fins definitely deserve the second spot on this list. While these fins are nearly as stiff as the last set was – which may be a pro for some – it is very easy on your feet. It won’t strain you too hard to use and wear them, even if you are completely new at freediving. The fins have a medium level stiffness and have foot pockets designed to make it easier for you to swim in deeper waters. They have quite long fins that will help easily guide you through the water. So if you want to experiment with kick strength, or you have a pretty average kick with an average body type, then you should consider getting this particular pair of fins. 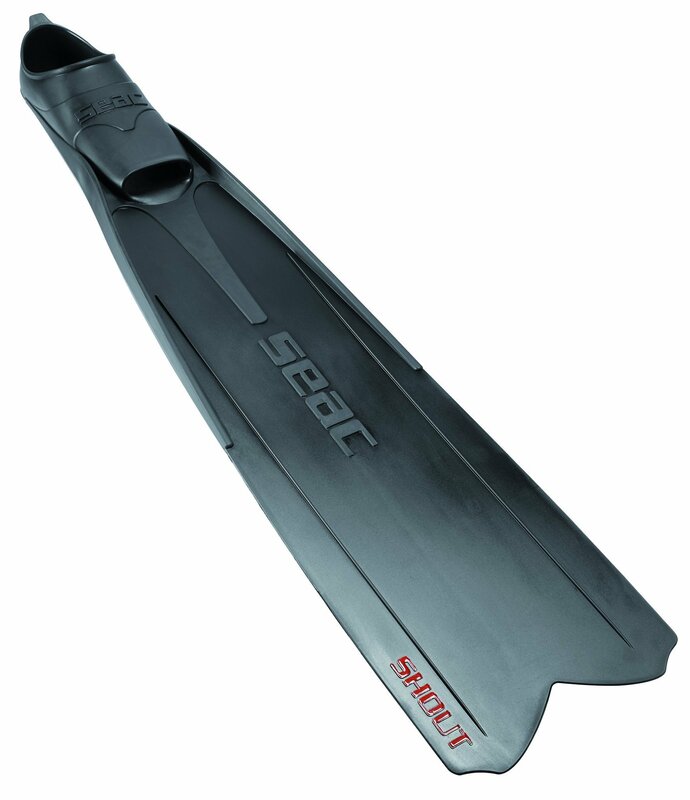 The SEAC Shout S1000 fins are a perfect set of fins for someone who likes to kick harder and have stiffer fins. If you want to kick softly or have softer fins – skip this pair of fins entirely in your search. The SEAC Diving Fins are made up of a composite material and designed with a full foot and hard blades. This makes them perfect to use for extended periods of time and is very powerful fins. The blade has a 22-degree angle to them, allowing you to expend less effort kicking while simultaneously improving the strength of your kicks. Perfect if you intend to spend a lot of time freediving in one shot. Another good feature of these fins is that it has an open-toe foot pocket, made with a thermoplastic elastomer, that is perfect if you prefer to wear socks while wearing fins. 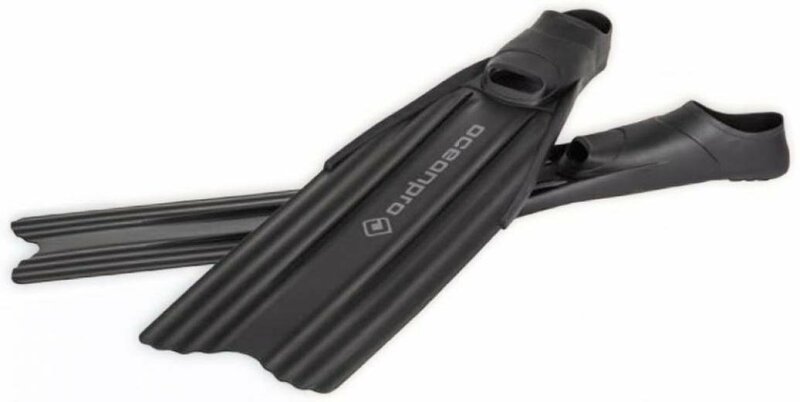 As it is made with composite materials, this makes the OceanPro fins an ideal choice for beginners. The composite material is meant to make the fins much more lightweight and flexible in order for you to get as much use out of them as you can. They also tend to have a very good fit when you order them, which also increases their popularity with online buyers. These fins have two long horns on both sides of the fins, which will create ripples in the water that will help you dive much more quickly. So, if you would like to dive deeper while freediving, these are a good set of fins for you to pick from as well. 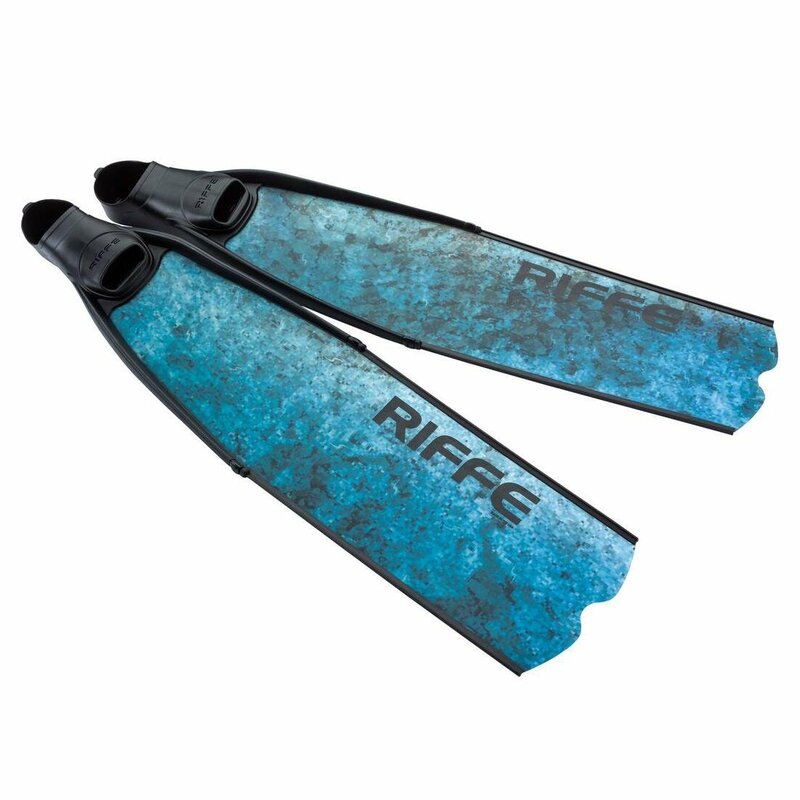 Although the Riffe G2 VELOC fins are made out of the more fragile fiberglass material, they are very effective and will assist you greatly in your freediving. The blade is set at a 25-degree angle, perfect for those who are no longer beginners, but aren’t quite experts, at freediving. It will allow you to move much more quickly through the water. Another pro to buying these fins, for some, can be the three different camouflage designs these long fins are available in. You also get a two-year warranty for a manufacturing defect in your fins – sorry, if you break them because they are too fragile and you were doing a lot of diving, that’s probably not going to cut it. There are also foot rails to help keep your feet in their own foot pockets. A con to these fins, for many, happens to be the higher price – especially with these fins made up of fiberglass. Now that you have heard some basic information about what freediving fins physically are like, let’s get into how they work. Freediving fins actually manage to work by pushing all of the water you are swimming through behind you. This is what allows you to be pushed forwards in the first place. This is important because they can part a larger area of water than your feet normally can, which provides much more push behind each of your kicks. This, in short, is how all fins work, freediving or not: You strap them on, kick your feet like you normally would, but you get to go much farther and deeper more quickly with these fins on. Freediving fins are meant to be long because it will provide much more power this way. Once again, covering more surface area provides a larger amount of water to be pushed back and down, allowing you to more forward more quickly. It also provides much more thrust. Instead of waiting for a slow accumulation of power, it can happen easily with a swift kick of your legs. The length of the diving fins also lends to their efficiency. Due to their shape, materials, and length, they can cut through water easily while acting as extensions of your feet. This is important because then water can more easily streamline past the fins, without causing too much drag. If there was too much drag, you would barely, if at all, continue to swim forward. How to Choose the Ultimate Freediving Fins for You? As you now know, there are many factors to consider when you are going to buy a pair of freediving fins for yourself – especially online, as shipping prices and size differences between brands makes it more difficult to do with ease. However, here are the most important things you should keep in mind when searching for a pair of fins. Make sure the foot pocket fits you properly. If it does not, then your fins will either fall off the second you begin kicking in the water or they will start cutting off your circulation if it is too small. Make sure to get the right amount of stiffness for you. Think about how you kick in a pool or an ocean, as well as your build, and you can imagine which stiffness would work best for you. Check the material of your fins to see if they are appropriate for your level of diving. A beginner, for instance, shouldn’t try to get fins made up of fiberglass. These are much more expensive to buy in many cases, and not nearly as durable. An expert free diver, on the other hand, may like this same pair of fins if they can afford it because they do have more thrust behind them. How to Test Fin Blades? It can be hard to test out your fin blades if you don’t know exactly what you should be testing for. Overall, you should be looking to see if these fins help improve your swimming speed or if they require less muscle power to use – the exception being deeper or faster dives. So here is a list of steps for you to take. Grab the sets of fins that you have. If you have done this test before, grab your former record sheet. Go through each pair until you have done a test with each of them. Note the amount of time to complete a lap around a pool. Did it decrease at all? Did you move too quickly and do all the tests in a row, wearing yourself out? Make sure to take breaks in order to ensure the test is the same each time. Record the number of kicks you needed to do in order to complete the lap. Write a description of each pair of fins. For example, did it require a lot of force to kick down? Was it very smooth diving with a pair of fins? Were you slower in any of the tests? There may be more to test for, of course, but this is an excellent place to start! How to Take Care Of Your Freediving Fins? Of course, one of the most important things to do for your fins is to care for them. This way, you can sure they remain in good use and will last you for a while yet to come. There has been a lot of information available for you within this article. I hope that you can make great use of it when picking out a new pair of freediving fins – or if you have now decided to go freediving! Make sure to keep your fins properly cared for, though, and there’s a good chance you’ll see them lasting the longest that way.